What's more popular, the Large Keyboard Tray or the Switch Keyboard Tray? While many customers enjoy having a separate mouse platform, we find that the single surface offered on the Large Keyboard Tray appeals to most people. If you have limited space underneath your desk, you will want to use the included 11" track. Although your keyboard tray will not be able to fully retract underneath the desktop, you will still be able to rotate the keyboard tray up to 360° to stow it away. What is the Track Spacer? Do I need one? The Track Spacer is an awesome addition, and yes, you will probably be glad you included it. The Track Spacer mounts over the crossbar running along the length of your desk. You will install your Keyboard Tray directly to the Track Spacer and then be able to fully retract your keyboard without running into the crossbar. Check out our Track Spacer Tutorial Video if you're still unsure about this add-on. Will the keyboard tray raise above my desktop? The keyboard tray can be raised to 3" above its track. If you have it mounted directly to the desktop, then it should raise to slightly higher than the desktop surface. However, if you are using a Track Spacer, then it may not quite reach the level of the desktop. I just installed my keyboard tray but the keyboard tray won't lower, what should I do? More than likely, you still need to remove the shipping pin from step four of the Assembly Instructions. Lift up on the front of the tray while lowering the back to relieve pressure on the pin. Then you should be able to easily remove it and begin using your tray. How should I clean my keyboard tray? To disinfect your keyboard tray and palm support, just wipe it with a Lysol wipe. What are the dimensions of the keyboard platform? The keyboard platform is 27" wide by 11.5" deep by 0.25" thick. Our lift-and-release mechanism makes adjustments easy. Simply lift up, move the keyboard tray to the desired height and it will lock in place once you release. The Track Spacer gives you more freedom to mount your keyboard tray track over your desk's crossbars, allowing you the flexibility to mount accessories even on smaller desks. 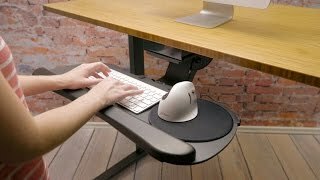 If your desk is only 24" deep, this allows you to place the 22" track over the crossbars so you can stow the keyboard tray completely underneath the desk. Enjoy a more ergo-friendly typing experience with a Goldtouch Adjustable Keyboard - GTN-0033. We feature ours at a discounted bundled price with this keyboard tray. This wired USB keyboard's split design promotes a more natural and ergonomic typing position, assisting your hands into comfortable typing postures.